St. Maarten in partnership with Carnival Cruise Lines and Royal Caribbean Cruises Ltd. announced plans for a $97.5 million expansion of its cruise facilities. A new pier and additional facilities will run parallel to the existing cruise pier. St. Maarten is a popular port call for cruise ships on eastern Caribbean itineraries. With the new facilities it's expected to draw more than one million annual cruise visitors (like those at right*). The new pier will measure 1,460 feet long by 50 feet wide. It will be capable of handling the largest cruise ships of 220,000 tons or more. The expansion project also will add an 853-foot extension to the Captain David Quay and add two acres of land to the Great Bay area -- connecting the new pier to the main thoroughfare in front of the John Craane Cruise Terminal Building. "The cruise sector plays an integral role in tourism to St. Maarten," said St. Maarten's Director of Tourism Regina LaBega. "These exciting plans are crucial to ensuring the continued growth of tourism and will enhance St. Maarten socially, as well as economically." The project is funded by a $40 million loan from the two cruise lines. 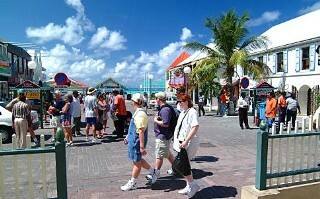 For travel information on St. Maarten visit www.st-maarten.com. *Photo is owned, copyrighted and used courtesy of St. Maarten's Tourist Board. All rights reserved. Do not copy to nor link to this photo. Thank you.